We have left the horse behind–he has a definite sweet tooth and a tendency to steal one’s candy. He’s also not above nipping. 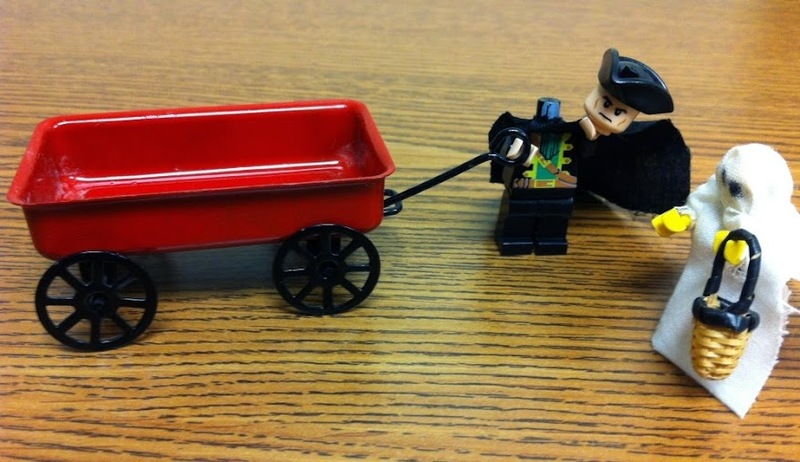 Though manual labor is beneath me, I will consent to pull the wagon from house to house. We are amassing quite the haul! I see at least some chocolate among the goodies. Midgardians are about 99% useless, but one of them did manage to figure out the cacao bean’s higher calling, so the race gets a “pass” from me and I won’t destroy them all just yet. It is growing difficult to manage the wagon, my head, and my temper while being jostled by hordes of diminutive, trick-or-treaters who are all screaming and veritably fizzing with ingested sugar. Here… I will just put my head on top of the pile. It can keep an eye out for marauders sneaking up from behind. Let’s just go to the end of the block and then head for home to see what we’ve collected! Sigyn and I discussed doing what is colloquially termed a “couple’s costume,” but we couldn’t agree on whom to be. She wanted to go as a pair of flower fairies, but I nipped that in the bud. (Ehhehehehe.) I wanted to be something disgusting and obnoxious, like Thor snogging Jane Foster, or something truly terrifying, like Sigyn’s half-sister Gunnehilde. We could have just reprised our pirate garb, but that seemed like cheating. Sigyn finally decided it was easiest to be a ghost. Not just any ghost, mind you. No, she is going around saying things like, “About fifty-fifty,” and “It might or it might not,” and “It’s the luck of the draw.”* And she has her little basket all ready for candy. I have decided to impersonate a famous, fearful fiend from Midgardian folklore. Is this not a good illusion? And look at what I can make the photo do! (Just watch it for a moment.) Mwahahahaha! Since, apart from tricking or terrifying one’s neighbors, this festival is about the sanctioned extortion of sweets, I have decided that no small basket or bag will suit my needs. I understand that a pillowcase is an accepted substitute. No, wait! I have an even better idea! Come, Sigyn! Mayhem and sweetmeats await! * She’s a “ghost of a chance.” Clever, yes? It took me a while to figure it out. I do love that girl! In which Sigyn and I create some Cucurbitaceous lighting fixtures. I wanted Sigyn to think BIG when choosing a pumpkin to carve. That’s more like it! These are fine specimens. Sigyn is too tender-hearted to be comfortable cutting into them. I have no such qualms. Plus, wicked knife skills! Hmm. So that’s what they look like inside. I haven’t seen such an innardy mess since that time Volstagg ate a whole elk in one sitting … without cutlery. Time to get to work. We have some serious scooping and scraping and slicing to do. Here is my creation. Not that I think my dearest’s face is frightening, it’s just that I thought it would be fun to capture her sweet smile. Look! It’s a Sigyn-o-lantern! I am very proud of this pumpk– Oh. My. Sigyn, as usual, has completely outclassed me in the field of arts and crafts. Well done, my cunning girl! Time to light them up! WOoooOOOOOooooOOooo! What comes next? Costumes and candy! I will admit I don’t fully understand all the aspects of the upcoming Midgardian holiday. Parts of it I get. I am the God of Lies (with a fantastic wardrobe), so you could say I am all about costumes and illusions. Trickery, of course, I excel at. Frightening people is a favorite hobby of mine. I am enthusiastic about candy. But this obsession with butchering gourds simply escapes me. Sigyn wants to try it, though, so I will go along with this inexplicable tradition. She wants to work on this little fellow. The human female is easily (and predictably) annoyed. Take, for example, the matter of mugs. She doesn’t like it when they start cluttering up the kitchen cabinets at home. She doesn’t like them in the break room at work, either. I’ve assembled a few here to give her the twitches. Oh, wait! I’ve found some more in the cupboard! None of them match!! And some of them are sticky!!! It might pay to study anatomy. See, Sigyn? This is what a real, actual, puny human brain looks like. How do they function? And this model shows you what one looks like inside. Hippocampus, thalamus, cerebellum, cerebral cortex, medulla, amygdala, olfactory bulb. This is where vision happens, and that’s for balance, and this is where short-term memory goes. Interesting. Speech…Speech. Where is speech? If I can find and poke Broca’s area, maybe I could make the human female shut up. And which particular node is it that houses suggestibility? If I can figure out just which bit of gray matter to tickle, I can have this whole campus kneeling before me and making me Chancellor by popular acclaim… Or, hey! There’s a state governorship up for grabs next month. The catalog that Sigyn and I have been poring over also sells costumes. Ghosts, witches, fairies, ninjas–all of these I can understand. But this? This is just wrong.